"NO POLARITY" means no battery reversal is required. For higher voltages please see NL512. For bicycle generators, please use the NL4XX range. Bulbs can be used with higher supply voltages than the listed range by reducing the voltage before it reaches the bulb with a step-down unit such as a Buck Module. NB: Older Metabo cordless lamps WITH DIMMING FUNCTION are not compatible with NL512. CAUTION: HIGH INTENSITY LIGHT - NEVER LOOK DIRECTLY AT THE LED WHEN ILLUMINATED OR SHINE INTO EYES. FOR SAFETY ALWAYS REMOVE BATTERIES OR DISCONNECT POWER SUPPLY BEFORE CHANGING A BULB.
" More Light For Less"
Very bright and clear illumination at lower power consumption to upgrade a variety of equipment from battery and dynamo cycle lights, flashlights, lanterns, and rechargeable tool lights up to 30V. In seconds, convert your favourite new or old lighting equipment to state-of-the-art super bright LED technology. For that retro look, even legacy items from the 1920s onwards in wood, Bakelite, full metal, art deco styling, etc. Many older lights were made to a much higher, more robust standard than current production; some virtually bomb proof. There is no need for good lights to be thrown away, possibly into landfill if they still work, and with LED bulbs they can carry on much more economically, at a far higher standard of whiteness and brightness. 1 CONSTANT BRIGHTNESS: All Nicelite bulbs work with a wide voltage range, and employ power compensation circuitry to maintain the LED at full brightness down to a low voltage, utilising the maximum battery capacity. They operate at a much lower power level than filament bulbs of the same brightness for extended battery life, minimising cost, waste, and operating temperature. Rechargeable batteries can be used for even greater savings, dispensing with single-use batteries. 2 PURE WHITE: The colour temperature of all white bulbs is pure neutral white 4000 - 5000K, for optimum visibility. This is in the range our eyes are most effective. Cree Inc. defines Outdoor White as 3500-5300K, and within that range, Neutral White as 3700-5000K. 3 1W LED EXCEEDS 6W HALOGEN: From tests and Customer Reviews (C), illumination by a 1W Nicelite bulb is superior to a 6W Halogen bulb, which in any case would be far too hot for many lights, with excessive battery drain. Bulbs for Maglite&REG; are even more effective, surpassing 10W Halogen bulbs. Emergency lights, such as in lift (elevator) cars, can run 6 times as long from the battery at the original or higher brightness when changing from halogen. 4 MAXIMUM EFFICIENCY LEDs are powered well below their maximum rating. For instance the Cree XP-G 3W LEDs in NL152 and NL252 are actually operated at 2W, which achieves higher lumens per watt of battery power. 5 THERMAL PROTECTION: To guard against excess temperature, automatic protection for the LED is included in all bulbs. Furthermore, Nicelite bulbs will not overheat your equipment as the heat dissipated is moderate, and lower than most filament bulbs. 6 PLASTIC BULB HOLDERS: All Nicelite bulbs from NL312 to NL512 are designed to operate for long, unlimited periods in either plastic or metal bulb holders. Please note that NL152 and NL252 require the Maglite&REG; over-sized aluminium bulb holder, or an equivalent heat sink. 7 NO POLARITY: For universal applications, Nicelite bulbs indicated by "NO POLARITY" in the table are independent of battery direction. This is important because cell direction cannot always be reversed, including most rechargeable lights and 6V lantern batteries. Series NL3XX and NL5XX contain a bridge rectifier as well as an electronic power controller. 8 SUPERIOR ILLUMINATION: Vastly superior illumination compared with any filament bulb of the same power consumption, due to a combination of higher colour temperature, far greater lumens, and a more even beam. An indication of the improvement can be seen.in the side-by-side photo of two Mini-Maglites&REG;. 9 LONG LIFETIME, LOW COST: Nicelite lifetime exceeds 30,000 running hours which is enormous compared to the life of miniature filament bulbs (typically 25-150 hours, depending on voltage). The initial cost, when amortized over the total lifetime, and operating cost are both much lower per running hour than filament bulbs. 30,000 hours is approximately 3 years of continuous operation. 10 SUPPLY VOLTAGE REDUCTION: Nicelite bulbs can be operated from a high frequency electronic power supply, which offers higher energy efficiency than linear designs. These systems are known as DC-DC converters, switching regulator, chopper circuits, Buck Modules, or switch-mode (pulse-width modulated) circuits, where the switched power is finally smoothed to the required output voltage. 11 DIMMING: Efficient dimming by Pulse-Width Modulation (switch-mode) is a method where the Nicelite LED is switched repeatedly fully on and fully off, at an invisible rate, over-riding the bulb's internal "constant brightness" circuit. There is a report using a Nicelite bulb in a Cat Eye HL1500 bicycle headlight (switch-mode low beam) in Customer Reviews (E). 12 VARIABLE FOCUS: Flashlights with focus adjustment, such as Maglites&REG; and Petzl&REG; Zoom, maintain that ability with a Nicelite bulb, and the beam is smoother than with a filament bulb. 13 BEST PERFORMING: Our aim with Nicelite is to provide the best possible illumination from a retrofit LED bulb. Bulbs designed to run in C and D cell Maglites&REG; produce up to 220 lumens. Some brands are rated at around 140 lumens. Nicelite dynamo tail light bulbs have a light output of 110 lumens from a low speed - on average 30 times brighter than a cycle dynamo filament tail bulb at full brightness (3 or 4 lumens). For battery applications, you can calcuate BATTERY RUN-TIME on the Bulb Options page. 14 ENSURING FULL BRIGHTNESS: Electrical contacts in lighting equipment can have high resistance and cause problems. Please see the Bulb Options page, "CONTACTS" section for details. 15 PARALLEL WIRING ONLY: When running more than one Nicelite bulb, bulbs should always be wired in parallel - where each bulb is connected directly to the battery, power supply, or bicycle generator. Nicelite bulbs should not be connected in series, eg not in a chain. If you would like advice on your application, please get in touch on: info@reflectalite.com. We wll be happy to discuss and help. A. CNC ARE A 'DROP-IN' 11.5mm DIAMETER BASE, SPECIALLY DESIGNED FOR C & D SIZE MAGLITES&REG;. Maglite&REG; have oversized metal bulb holders with a greater heat sink allowing higher LED power and lumens. The flange diameter is 13.5mm without a V notch. B. PUSH-IN ARE THE STANDARD HS3 / KPR / PR - P13.5s INTERNATIONAL FLANGED BASE, 9.2mm DIAMETER BARREL, with flange "V" notch. C. SCREW-CAP ARE THE STANDARD E10 / MES INTERNATIONAL BASE, 9.5mm DIAMETER THREAD. D. Bulb Codes are laser etched on the bases for identification at any time in the future. a) Fit in place of original filament bulbs as they require less space than the glass envelope of conventional bulbs. b} Maintain the ability to adjust from flood to spot light by rotating the focus bezel on certain lights, including Maglite&REG;, Petzl&REG; Zoom, and VistaLite&REG; VL400 series cycle headlghts. c) Bulbs NL152 and NL252 will produce a smooth bright floodlight for close-up work by removing the Maglite&REG; head. Unlike filament bulbs, a collimator or diffractor immediately in front of the LED controls the initial beam angle for more precise and efficient illumination. Light output is modified by any existing reflector and/or outer cover lens in the normal way. The original (filament bulbs) area of light is still visible to observers and road users. Tests indicated sigificant advantages of UNIVERSAL (180° beam) bulbs over standard beam, and we have moved towards UNIVERSAL BEAM for general purpose and bicycle light retrofit bulbs, even when used with a reflector. STANDARD BEAM BULBS: These Nicelite bulbs are designed for modern parabolic reflectors and produce a controlled beam in flashlights, cycle headlights, head torches, rechargeable tool lights, Maglites&REG;. The central beam with a STANDARD beam bulb wll be similar to the original, only much brighter and whiter. Light is still directed at the reflector, but any deficiencies in the reflector will usually be less obvious. 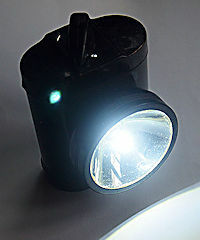 Non-standard wide, narrow, elliptical, and irregular reflectors (the last two sometimes found in cycle lights and compact flashlights) are best converted with a UNIVERSAL bulb. UNIVERSAL BEAM BULBS: These bulbs are most versatile and provide both an excellent focused beam with reflectors in flashights, cycle lights, and lanterns, and 360° area illumination by diffraction in a lantern dome, 3D viewer, close-up work, cupboard light, etc. UNIVERSAL beam is also suitable for Bardic colour signalling lanterns, and are recommended for all cycle headlights with a pattern on the lens, and lights which have an oval, extra wide, extra narrow or irregular reflector, including the vintage Ray-O-Vac Hunter, and Delta PowerLite lanterns, and the popular Cat Eye HL500 cycle light, which provide improved illumination with a UNIVERSAL beam bulb. 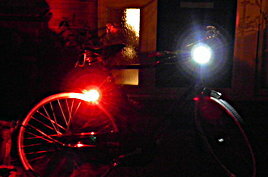 UNIVERSAL BEAM bulbs are recommended for all bicycle lights, whether vintage or modern. The unique NL412, NL432 and NL437R LED cycle dynamo bulbs are designed to produce the maximum light to the front and rear, powered by a 6V bicycle dynamo generator. They illuminate as soon as the bike begins to move, and reach full brightness at a much lower speed than filament bulbs. The tail bulb, NL437R is very bright, like a fog light for extra protection in bad weather. We could have made this bulb lower cost and lower brightness, but as the power is available, we opted for the maximum light and best protection for riders. NL437R emits red light for the highest efficiency with both red and clear tail light lenses. DYNAMO STANDLIGHTS: Nicelite dynamo-generator bulbs can be used with a simple Capacitor Dynamo Standlight Circuit to keep the lights running when the bicycle stops for additional safety..
Nicelite bulbs, with their high lumens output, offer an assured, convenient and lower cost alternative to replacing dynamo lights with LED units. The headlight bulbs are pure daylight white for enhanced visiility. Nicelite bulbs will upgrade 6V dynamo lighting sets of all ages, right back to classic vintage units. Nicelite dynamo bulbs have reliable protection from over-voltage in case of regulator failure, or if a regulator was not originally fitted. 1. NL412, NL432, NL437R LED dynamo bulbs require a regulated 6V AC generator supply, or 2.5V-6V DC +ve on the solder tip. Regulators are factory fitted only in (a) headlights originally supplied with a flanged HS3/KPR/PR bulb, and (b) LED standlights. Most systems with a modern hub generator require an XGEN5 external regulator due to the elevated power output at higher speeds. 2. IMPORTANT TEST RIDE; The bicycle should be taken on a safe test ride at cruising speed for around 10 minutes to check whether the LED bulb remains at full brightness. 3. Dimming or total light loss indicates inadequate circuit regulation. One External Regulator must be added to the circuit, item codes XGEN (tyre dynamo), XGEN2 (Sturmey Archer Dynohub), XGEN5 (modern hub generator). 4. The LED bulbs have overload protection, which reduces power temporarily during excess voltage. 2.4W 6V HUB GENERATORS: These units can power 1 or 2 Nicelite dynamo bulbs, eg 2 headlights (2 x NL412 / NL432) or a head and tail light (NL412 / NL432 + NL437R). 3W 6V TYRE DRIVEN AND HUB GENERATORS: Standard 6V 3W dynamos and 6V 3W - 4W hub generators can power 1, 2 or 3 Nicelite dynamo bulbs. For instance, rather than just one headlight, it is possible to have two headlights (NL412, or NL432) with a combined brightness of 220-260 lumens from walking speed, providing more light than two 6W halogen headlights, as well as an equally powerful, extremely bright tail light (NL437R). One headlight could be switched and set as a horizontal "main" beam, and the other dipped to illuminate the more immediate area. This could be very useful when riding in dark, unlit areas, particularly a winding country road or track with sudden undulations. A 4W hub generator could actually power four Nicelite dynamo bulbs. Schmidt E6 headlights, which include an integral switch, are available as primary and secondary generator headlights, and already incorporate the concept of twin dynamo head lights. However, Nicelite bulbs do not actually need a dedicated secondary headlight, as two or even three standard headlights will illuminate from a low speed with Nicelite dynamo bulbs and a 3W dynamo/generator. NOTES: Unlike filament bulbs, it is not necessary to match total LED power to the dynamo/generator output. There can be an electrical load of 1W, 2W, 3W, or even 4W (4W generator only) eg up to four Nicelite dynamo bulbs. REGULATION of the circuit by an existing or external regulator is essential, as stated in NOTE 4, below. Nicelite bulbs should always be wired in parallel - where each bulb is connected directly to the bicycle generator. Do not connect in series. With a hub generator or low drag dynamo, Nicelite bulbs can be operated at all times, day and night for the extra safety factor, as Nicelite bulbs take a very long time to wear out (over 30,000 hours of run-time). COMPATIBLE WITH VARIOUS HEADLIGHT DESIGNS: We originally tested an NL412 in a Schmidt E6 headlamp powered by a battery to allow static photography. E6 optics concentrate the light into a long diverging strip ahead. 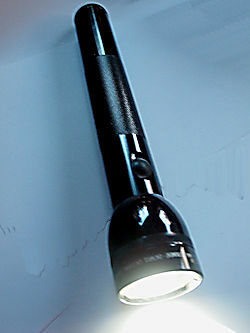 The same beam shape as the original halogen bulb was created, but much whiter and brighter. See the images above. The "Universal" beam outputs of NL412 and NL432 give an excellent performance in various designs of other bicycle dynamo headlights. The tail light shown above is illuminated by the very bright Nicelite NL437R red tail light bulb. LOW SPEED STROBING: Hub generators will produce a strobing light at low speeds. Above around 7.5mph (12kph) the light merges into a continuous beam. S mall wheel bikes reach a steady beam at lower speed. For most cyclists this has proved acceptable, as a steady, bright light is achieved within two seconds, at below normal cruising speed. Tyre driven dynamos produce a steady beam from a very low speed. 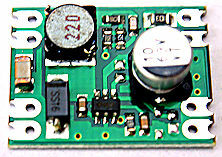 To remove strobing, a Super Capacitor Standlight Circuit can be added. STURMEY ARCHER VINTAGE DYNOHUBS 6V 1.8W GH6: GH6 Dynohubs are hub generators with two output terminals on the side. Model GH6 were manufacture d from 1945 to the 1980s.They should not be confused with modern higher power Dynohubs (X-FDD, XL-FDD) made by Sturmey Archer since 2010. ONE or TWO Nicelite LED dynamo bulbs can be illuminated by a GH6 Sturmey Archer Dynohub, eg one headlight (NL432 for an original headlight, or NL412 for a modern headlight) and one very bright tail light (NL437R), OR two headlights, each with an output of 120 lumens, which compares extremely well to the best halogen headlight upgrade at 24 lumens (no longer available), and a standard dynamo tail bulb at 3 or 4 lumens. The output of GH6 Dynohubs is actually 2W, exactly the power required for two Nicelite LED dynamo bulbs. REGULATION of the circuit is usually required, and can be achieved by simply fitting an XGEN2 on the Dynohub terminals, or by using an LED standlight (capacitor back-up) light. STROBING: Nicelite bulbs with a Dynohub are a radical improvement over filament bulbs for today's road conditions. There is strobing of the lights up to quite a high speed, which provides greater visibility in towns and cities, day and night. Strobing is due to the lower number of magnetic poles compared with today's hub generators which produce strobing only at low speeds. 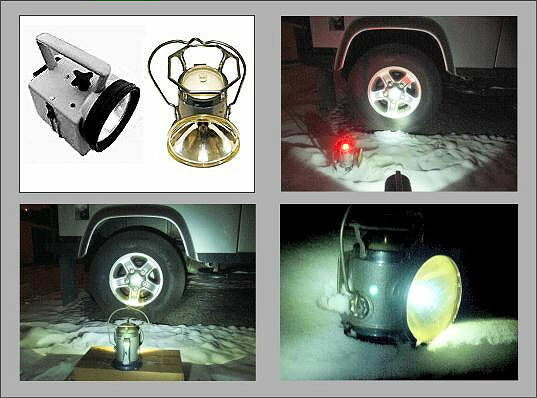 Dynohub strobing can be prevented with a standlight system, as discussed below. STANDLIGHT: GH6 Dynohub strobing can be eliminated with a Super Capacitor Circuit , or an original Sturmey Archer FSU (Filter Switch Unit), or by making a miniaturised system with three alkaline AA cells or three NiCd rechargeable AA cells. On dark, unlit roads steady headlights are preferable. With a suitably configured standlight unit strobing can be switched on or off as required. Versions are shown on the Circuit Diagrams button. The Super Capacitor Circuit and FSU will additionally provide a standlight back-up function front and rear, at full brightness with Nicelite dynamo bulbs. NL412, NL432, NL437R will operate on 2.5V - 6V DC (tip +ve as shown in the circuits) in addition to AC from the Dynohub, at constant brightness. The Super Capacitor Circuit and FSU may be small enough to fit inside a Dynohub headlight. We have received a review reporting that Nicelite Bulbs with a Sturmey Archer FSU work successfully, with steady lights, and our customer writes "very impressed and happy with the performance". The image (above right, adjacent to the instructions) show NL432 and NL437R Nicelite bulbs powered by an original Sturmey Archer FSU while obviously stationary. LED technology literally offers a brilliant future for the much loved classic Sturmey Archer Dynohubs. STURMEY ARCHER DYNOHUB TAIL LIGHT FITTING: Some of these have a capless wedge bulb which is unavailable as a filament or LED bulb. It is possible to fit an E10 (MES) bulb holder by carefully cutting a hole in the plastic with a Dremel or similar miniature power tool together with drill bits and rotary burrs (many small holes and join them up). The adhesive must be non-fuming. Superglue is UNSUITABLE as the resulting fumes will ruin the interior. Epoxy can be used, allowing time for curing before re-assembly. An E10 bulb holder can be obtained as a bare unit with solder tags, or removed from an E10 batten bulb holder. We can supply bare E10 bulb holders, as pictured. ALL DYNAMO-GENERATORS: An external regulator to limit the voltage may be required. Please go to the Dynamo Regulator section. In the Regulator Selection Table, please identify your generator type, the dynamo lights fitted, and then the regulator model, if required. One regulator controls the entire circuit, including headlight and tail light voltage. NB: NL412, NL432 and NL437R incorporate special "fail-safe" electronic protection, and automatically reduce power if they experience over-voltage from a non-regulated dynamo. They are not damaged by this, and revert to normal brightness when the applied voltage reduces to 6V or less. Whether it's a recent halogen or krypton cycle light, such as the curved and stylish Cat Eye HL1500 "Hyper Halogen", or a vintage model, such as the British Ever Ready "Frontguard", the Pifco chrome "Octopus" tail light, the British Ever Ready grey metal "front cycle lamp" (also sold by Ray-O-Vac in the USA), or the classic Joseph Lucas "King Of The Road" from the 1920s shown on the right, Nicelite can achieve a huge upgrade. Whatever their age, lights can now have the same high LED efficiency and fade-free brightness exceeding 6W halogen with NL322 and NL343, depending on the bulb fitting required. NL322 and NL343 have virtually the same, but slightly higher, light output compared with the NL412 test shown in Note 3. TAIL LIGHTS: Use a red LED bulb, NL348R, NL350R. These 1W bulbs exceed 6W halogen bulbs, a "fog light" for bicycles! Note A. The red tail light in the photo on the left had an earlier, much lower brightness model. The red LED light will pass through a red lens with little loss, unlike filament bulbs where all the light is stopped by the red filter except the red component. Note B. White Nicelite bulbs are too bright for a red lensed tail light and will "wash out" the red to pink. Vintage bicycle lights with a bulb that will be switched between a dynamo-generator and a battery should be fitted with NL432 in the headlight, and NL437R in the tail light. 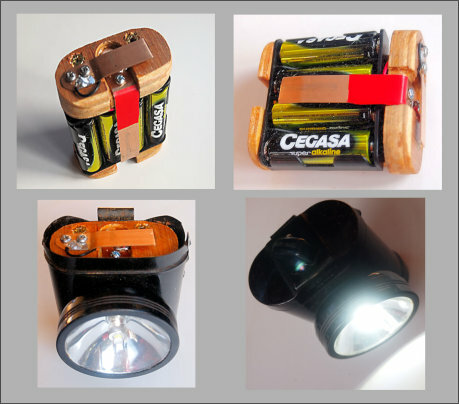 SINGLE CELL BATTERY CONVERTER: If you have a vintage bicycle lamp that takes just one battery, you will need to raise the voltage to drive a Nicelite LED bulb These lights are very dim with the original filament bulbs, but with LED they can be just as bright as lights with two or more cells. If the battery is D size (LR20), there are AA to D adaptors to allow AA cells to be used. One, two, or three 3.6V AA lithium primary cells or type14500 (AA) 3.7V lithium-ion rechargeable cells could be used. An AA to D cell adaptor avoids any modification to the vintage light and maintains switch function and bulb contact which may depend on the original battery size. Multiple lithium cells (if used) should be within 0.5V when inserted into the adaptor. EVER READY 800 BATTERY CONVERTER: The 800 was a 3V battery made from two zinc carbon "F" cells, and has been obsolete for many years since plastic largely replaced metal bicycle lights. The battery may have been available under different identities in various countries. Many classic vintage bicycle lamps require the 800 battery, which is approximately 1.5 times the height of D cells. We have made a converter for Nicelite bulbs, using a 4 x AA battery holder, although the idea could be used with other batteries. Photos opposite. Construction is in 10mm plywood. The thickness at the lower end of the battery holder was reduced where there is also a cut-out to clear the bulb. The contacts are 1/2" x 0.025" phosphor broze half-hard strip. Although the prototype functions correctly in the Ever Ready headlamp pictured, it would probably be an advantage if the phosphor bronze was thinner. Care must be taken when inserting the converter to avoid undue pressure on the end of the bulb. The bulb contact strip (red) is bent towards the battery at the end. There was an Ever Ready Battery Adaptor 700A, but that is difficult to find. Our converter concept will allow these great metal bicycle lights to be used again without modification, except for a bulb change to Nicelite NL343. The only difference will be a reversible upgrade to much higher brightness for modern road conditions. Please Note: The adaptor described above is not in production. The details are offered to customers as a way of making their own 800 battery adaptor / converter. MAKE YOUR OWN LED BICYCLE LIGHT SYSTEM: It It is now possible to build an effective, lightweight, and economic LED bicycle lighting system by converting dynamo lights to LED, or using single or twin headlights from a previous battery pack system, and Nicelite LED bulbs. For example, four 2Ah NiMH AA cells (4.8V) and a Nicelite NL322 or NL343 will give around 10 hours run-time with one headlight, or around 5 hours with 2 headlights, at constant brightness, each better than a 6W halogen bulb. Note: If the headlight has a dynamo regulator, the battery voltage must not exceed 6V, or the regulator should be removed. One fuse or fused lead as near as possible to the battery is recommended. The Schmidt E6 is a excellent modern headlight for a battery light system, and has an integrated magnetic switch and tail light output, so it just needs an NL322 and a power supply of 2.4V up to 6V maximum. H Miller & Co made several styles of classic twin bulb dynamo headlights with a 3-position switch and tail light terminal. Good models are sometimes available on eBay and other auction sites. Switch positions are: O = dynamo main beam + tail light, D = dynamo dipped beam + tail light, B = battery dipped beam + tail light. The battery space is 66mm x 91mm, originally for a type 800 3V battery. Miller also made some classic metal dynamo tail lights. The system could be adapted for battery only operation with Nicelite series NL3XX bulbs, or used with a dynamo-generator and Nicelite NL4XX dynamo bulbs that will work with both AC dynamo power and DC battery power. For charging a single Li-Ion cell, or almost any type of rechargeable battery pack it may be useful to consider an IMax B6, IMax B6-AC or similar programmable charger. These chargers can often be purchased at a big discount on eBay, Amazon, etc, as well as battery packs, individual cells, and battery holders. Of course there are also chargers with integral holders for individual cell types, including Li-Ion 18650. There is no need to wire Li-Ion & LiPo cells in series as 3.7V- 4.2V is fine for Nicelite bulbs. If you need more capacity you can usually parallel the cells. It is recommended to have the cell voltages within 0.5V beforehand. You can read about parallel Li-Ion here: Parallel Li-Ion Charging. Parallel 18650 battery holders are available. Higher capacity Li-ion, such as 26650 can alternatively be used. If you plan to solder rechargeable cell(s) into the circuit, you can purchase cells with solder tabs (essential for soldering). Include "tab" in your internet search, eg "Li-Ion 18650 tab". E BIKES (ELECTRIC DRIVE) BIKE LIGHTS: There is NL512 for batteries up to 30V. Battery voltages of 36V, 48V and above can be r educed by a DC-DC converter to operate bulbs such as NL322 and NL343 in the headlight and a red Nicelite in the tail light. A common and efficient method to reduce voltage is by a Buck Module step down unit. There are many types to choose from. For instance a module with an input of 6-58V DC and a fixed output of 5V (USB) with a capacity of 600mA will supply up to three 1W (1.5-9V) Nicelite bulbs. A Buck Module with these characteristics is shown opposite. It is very compact and can reduce the voltage of four fully charged 12V lead acid batteries. Buck Modules are also available fully sealed for outdoor use. We will shortly feature a sealed Buck Module with a higher power capacity. Note: Some e bikes have 6V dynamo lights, and in these situations Nicelite head and tail dynamo bulbs can be used (NL412 / NL432 and NL437R), with a regulator if necessary, as discussed in Notes 3 and 4. Nicelite bulbs will upgrade new and vintage lights to far higher brightness than they achieved previously. Nicelite bulbs with Universal Beam can produce a long spotlight beam or wider work light, depending on the reflector design, and Universal Beam will also illuminate a lantern dome, and produce area illumination. Excellent results have been obtained in a variety of equipment, including NL343 in the well known Petzl Zoom headtorches. Colour bulbs can be used for signalling, and will radiate a colour from a lantern dome which is either transparent or th e same colour. MAGLITES&REG; can be upgraded with NL152 and NL252 to an even higher level than plastic flashlights, due to their aluminium over-sized bulb holder which provides a greater heat sink for the LED. NL152 and NL252 fit original Maglites&REG; and they are supplied with bezels to fit Magnum Star&REG; models. 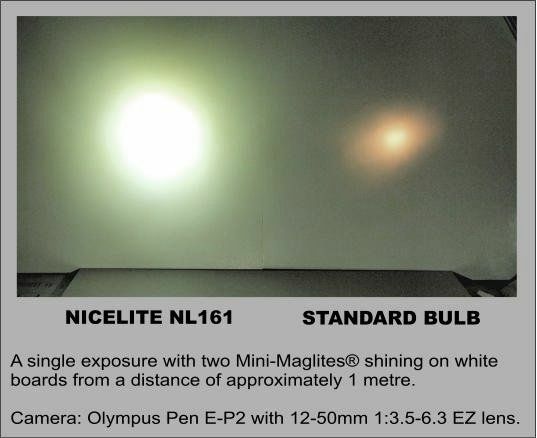 What's more, for Mini-Maglites&REG;, Nicelite NL161's increase in whiteness and brightness over the rather dim and yellow standard bulb transforms the Mini Maglite&REG; into a far superior product, as shown in the photos. There are Nicelite upgrades for the other small Maglites&REG;, including Solitaire&REG;, as shown in the Nicelite range. New LED bulbs for Maglites&REG; - NL152 and NL252 utilise Cree XP-G. Optimized for high lumen directional lighting applications, the Cree XLamp XP-G sets a new standard for LED light output and efficiency. The XLamp XP-G is capable of delivering up to 493 lumens at 93 lumens per watt when driven at 1.5 A, although we under-run to match the available Maglite&REG; heat dissipation, and this raises efficiency further. Others have tried to match XP-G performance but no one has come close. Now, the XLamp XP-G is even brighter. XP-G is the first LED with over 10,000 hrs of long-term testing data, a reported Lifetime of greater than 60,000 hrs, and still raising the bar for LED performance. BARDIC SIGNAL LANTERNS work well with the white NL322 on clear and filters. Some Bardic green filters are rather weak and can be made denser with stained glass paint to avoid being "washed out" by the high brightness and whiteness of NL322. The alternative NL312 are used to preserve filter colour density on several preservation heritage railways and railroads. There is a Bardic railway conversion review N on the Customer Review Page. NIGHT EMERGENCY: We tested three Nicelite bulbs in two robust, heavy duty lanterns in a sub-zero night time car problem scenario. The lanterns are the British Bardic colour signalling lantern manufactured in cast aluminium, and the USA Delta PowerLite of substantial steel construction from around WW2, as shown in the set of four photos. In the upper right picture the Bardic is providing the task lighting with a Nicelite NL321 (now upgraded to the brighter NL322), and the Delta is running an NL336R (now upgraded to the much brighter NL348R) in the dome for the red safety light. In the lower left, the Delta is providing the task light from an NL331 bulb (now upgraded to the brighter NL343) in the reflector. The lower right shows the Delta's lens, with some yellowing of the plastic due to age, but the illumination is nevertheless superb, radically better than the standard bulb, as anyone who has a PowerLite will recognise. With the Delta's very high build quality and toughness, and the Bardic's sturdy aluminium body matched with Nicelite bulbs, there is a new future for these great industrial lanterns. For even greater savings, changing to rechargeable batteries or even a different battery type could be considered. For instance heavy 6V lantern batteries could be replaced by one or two 3.7V Li-Ion cells, or three alkaline manganese / NiMH cells in battery holders with connecting leads soldered to the battery contacts. 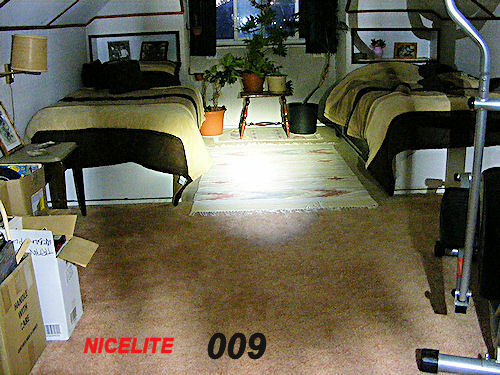 The Nicelite bulb(s) will be just as bright at 3.7V. 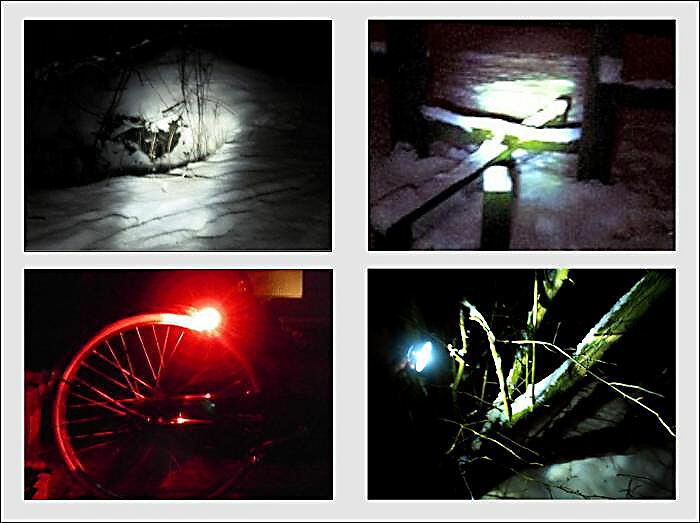 See Note 5 for some ideas in the section sub-titled "MAKE YOUR OWN LED BIKE LIGHT SYSTEM". For a rechargeable battery, a fuse or fused lead as near as possible to the battery is recommended. SINGLE CELL ADAPTOR: If you have a vintage flashlight that takes just one battery, you will need to raise the voltage to drive a Nicelite LED bulb. 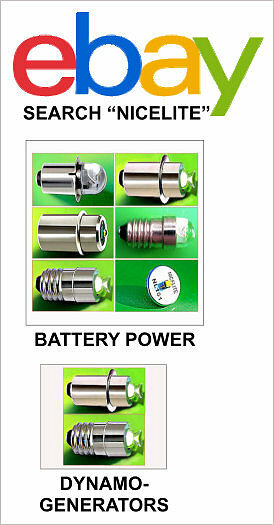 If the required battery is D size, there are AA to D adaptors to allow AA cells to be used. One, two, or three 3.6V AA lithium primary cells or 14500 (AA) 3.7V lithium rechargeable cells could be used. Using an AA to D cell adaptor avoids any modification to the vintage light and maintains switch function and bulb contact which may depend on the original battery size. Multiple parallel lithium cells should be within 0.5V when inserted into the AA to D adaptor. CORDLESS TOOL LIGHTS:The higher voltage range NL512 (6.6V to 30V) is suitable for cordless work lamps such as those by Dewalt, Milwaukee, Bosch, Hitachi, AEG, and Makita. We have tested Nicelite LED NL340 and NL343 in View-Masters, with these Reel sets: Desert Flowers, Wonders of the Deep, Grand Canyon 1, New York City Manhattan Scenes, and The Great Pyramids and Sphinx. In all cases the image quality is excellent, with bright and even illumination from the daylight white LEDs. NL343 with its much higher brightness gives particularly vibrant images. NL340 and NL343 are an effective LED conversion for View Master models C, D, E, F, H, and 3-D Realist Red Button. It is not necessary to change the battery directions as the bulbs are non-polarity. These Nicelite LED bulbs offer brighter viewing at 50 and 140 lumens, lower battery drain and temperature. 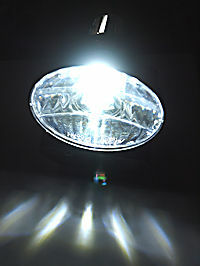 STANDARD MONO SLIDE VIEWERS with an opaque diffuser between the bulb and the slide may not work well with an LED replacement bulb because miniature LED bulbs do not emit an even light, but rather the light is concentrated by diffraction. This is in contrast to 3D stereo viewers, discussed in the preceding paragraph, which usually have a matt white back screen that successfully integrates the light from an LED bulb into completely even illumination..